Hi, all. I bought a 2016 Honda Accord last fall and have decided I'd rather have a different car. That's it in a nutshell. Wasn't sure where to post my question so I chose the Depreciation category. What I really want advice on is how to sell it. (and before anyone asks, no, my car isn't a lemon-I like it just fine). My only quibbles with the Honda are that I don't really like the CVT transmission too much, and the Apple CarPlay has a couple of bugs with it. But that has only about 1% to do with my decision to sell. I test drove tons of cars last year and did lots of research, about 5 months' worth, in fact. In the end, it came down to the Accord or the Ford Fusion. I now want a 2017 Ford Fusion and have factory ordered one from a local dealer. So my question is: what's the best way to get a good price on a new car you're trying to sell? Thanks! The 16 Accord is a good car and should sell, at the right price. You should have a good deal by ordering from the factory but likely need to pass it on the prospective buyer, to move the Honda. 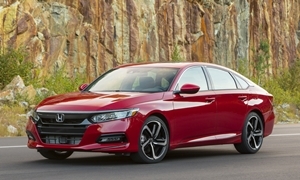 If you want more sporty, did you check out the Accord V6 or SI turbo stick shift Good luck. I think both of your reasons for not liking the car are legitimate. Honda has some of the worst electronics in the industry, cheap junk made by Pioneer, and the CVT is no joy to drive for an enthusiast. I have a 2014 Accord with a manual transmission and the least expensive audio system so I'll keep it for a while. But my cell phone which pairs with everything else I have tried, Camry, Prius, Nissan Frontier, and two Garmins absolutely won't pair with the Accord. The dealer won't help and says "they are all like that". I would start by looking on KBB, Edmunds, Black Book, etc and get a very good idea of what your car is worth both for private sale and trade in. Then decide if the extra money you would get for a private sale is worth the hassle. Trying to sell a car you may meet some very undesirable people, people who want you to finance the sale because their credit is so bad they can't get a loan, people who will abuse the car on a test drive, etc. If you decide to sell it yourself you can find some good advice if you do a search. Such as don't invite the buyer to your house, meet in a public place, take a friend along, etc. On the other hand if you trade it in you will avoid those hassles but it will cost you a few thousand dollars to do so. I usually just bite the bullet and trade but I will go to as many dealers as I can looking for the best deal. Good luck. I have no experience on private selling so I won't comment there. But if you have a CarMax nearby it's a must do to drop your car by there for a free qoute. They will buy it from you outright. But better yet, they will give you a quote. You can take that quote to the dealer you are buying your Fusion from and see if they will match it. Often they will. Unfortunately you are not in a position of strength here since you ordered a car - you can't walk to another Ford dealer down the road. But typically CarMax offers decent $$$ compared to most dealers. One advantage to this approach is, while you leave some money on the table by not maximizing sale price, you will reduce your sales tax owed. Not to mention overall headache and risk dealing with potential buyers. CaraMax is worth a shot, as is "We Buy Any Car." You can get a quote via their web site but when you go they will look for any little flaw to deduct money from their original quote. They are easy/no hassle to deal with but will probably not provide the maximum value, which would be private sale. However, if there is a location nearby, it's fairly painless to find out what they offer (and you can negotiate somewhat). If you're not happy just leave. Thanks for all of the helpful responses! Very helpful, in fact. I think I will try CarMax out just to see. We have one close to my home. I was a little unsure because I've read where they REALLY lowball you, even worse than dealers. But maybe that's untrue. My car retails for around $31000 before tax, title, license and doc fee. My hope is to get around $27000. Most I've been offered in terms of cash was $25000-2 dealers have offered $21000 and $23000 as trade-in value. I've had other cash offers of $23000 and $24000 using TrueCar's TrueSell app. Right now have it listed on Cars.com, CarGurus and Craigslist. Debating whether to list it on eBay Motors. Will also check out "We Buy Any Car"-I've seen their TVcommercials. Have done research online re: car's value (Edmunds, KBB, NADA, Black Book) but the values vary enormously (as low as $20000 and as high as $28000). Hard to decide where to price it. Thanks again! Your car had a MSRP of $31,000 which means it could have been bought for around $29,000 cash and no trade. There is no way you will get $27,000 for a used model. $25,000 would be a fair selling price if it has less than 10,000 miles. Thanks, Clay. I'll keep that in mind. However, I disagree with your conclusion. If the very first offer I got from a dealer is $25,000 cash, then I most certainly can try to get more than that in a private sale. The rule of thumb is that however much a dealer will give you, a private buyer will give more (otherwise people would only ever sell their cars to dealerships-less hassle that way.) And ALL of the classifieds I'm seeing for my carare pricedat LEAST $28,000. I'm willing to come down some, but $25000 is too low. Thanks again foryour contribution. When you sell the car privately, you will lose the sales tax credit you would get if you trade it. So, make sure you take that into consideration when thinking about trading or selling privately. I've sold all my cars privately, and made out financially vs. trading, BUT selling higher priced cars privately WILL take MUCH longer. In your case, I'd trade.